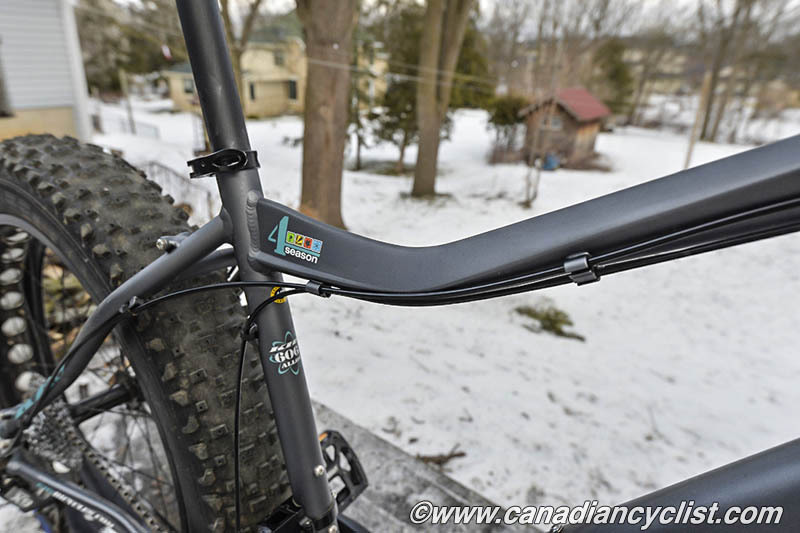 This is the first of five reviews of the newest style of mountain bikes to hit the mainstream market - fat bikes. 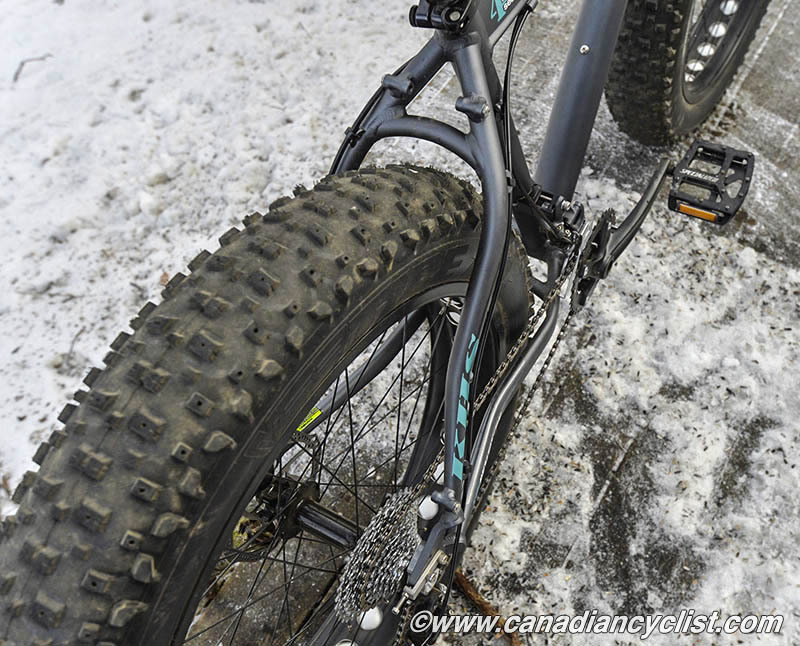 Read our Overview of Fat Bikes for some background on this category. 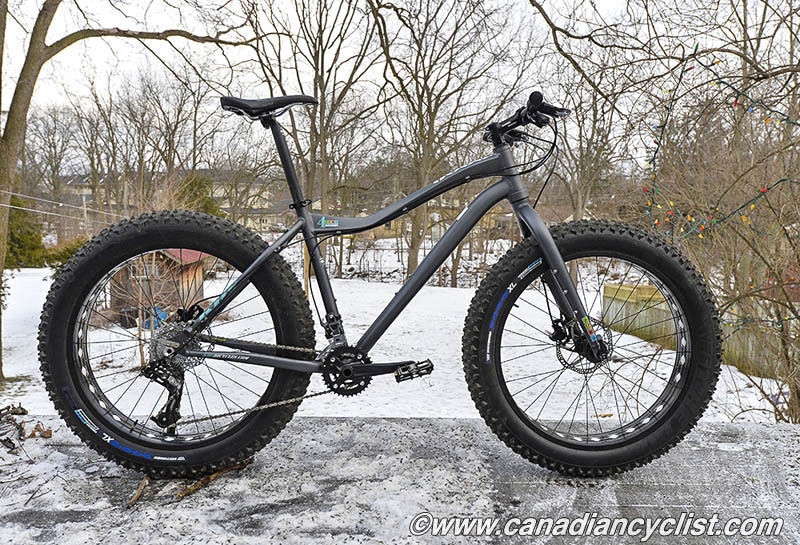 KHS has four models of fat bikes for 2015, all under the series '4 Season'. The first three - 500, 1000 and 3000 - have alloy frames and higher quality components at each level, while the top of the line 5000 offers a full carbon frame and fork. Prices range from $999 for the 500, to $1299 for the 1000, $1999 for the 3000 and $3299 for the 5000. The 3000 and 5000 are basically identical spec except for the carbon frame and fork (and a different crank), with the 3000 we tested offering probably the best value. The 3000 frame is a sloping top tube design, built with custom formed 6061 aluminum. Both the top tube and down tube have been shaped, with the top tube transitioning from a more square shape at the head tube to a triangular one at the seat tube. The fork is oversized alloy with the traditional U-shape crown. The head tube is tapered and the stays (seat and chain) feature S-curves for clearance. The seat stays have an additional curved brace for rigidity. One interesting option is an adjustable rear dropout, allowing you to change the wheelbase. Overall, it is a sturdy and cleanly finished frameset, albeit not particularly light weight. Component-wise, the 3000 is well equipped for its price point, with SRAM derailleurs (X7 front and shifters, X9 rear), and Hayes Prime Sport hydraulic disc brakes front and rear. Handlebars and stem are Kore, while the crank and seatpost are KHS-branded alloy. The gearing is a wide ranging 26/36 on the front mated to a 11-36, 10 cog rear cluster. 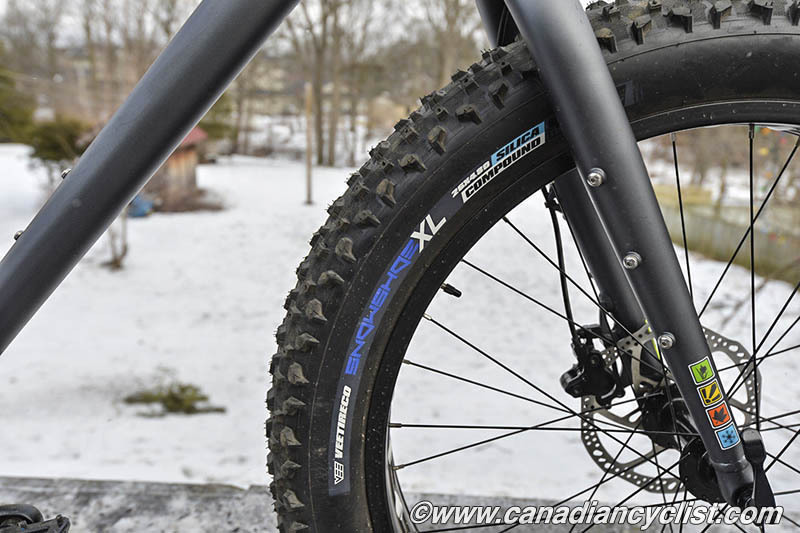 The wheels deserve specific description, since they are the key element of making this a fat bike. Fat bike rims can be anywhere from 44mm wide to 160mm, and these are slightly on the wider side than most at 100mm (the widest of any of our test bikes). This goes hand-in-hand with the tires - Vee Rubber Snow Shoe XL - at 4.8" wide. These are massive tires, with a fairly aggressive knob pattern. 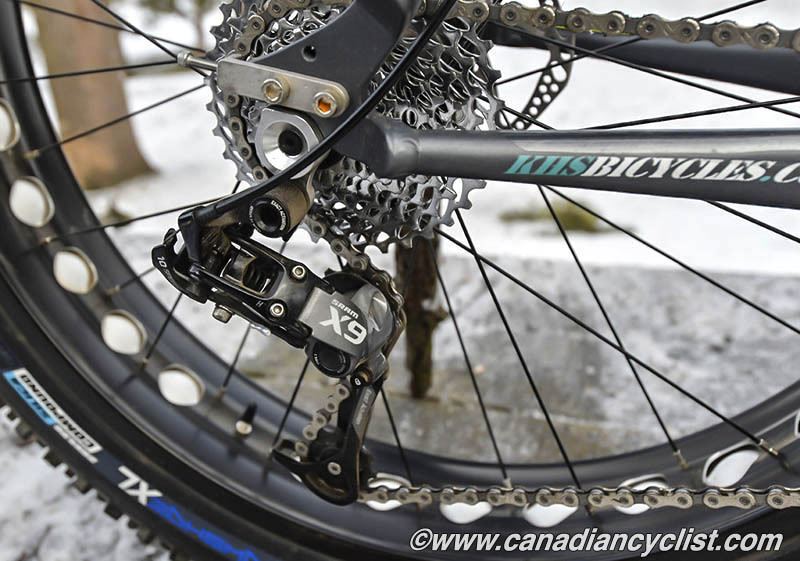 All in all, the KHS 4 Season 3000 is good value at $1999. Now, to the ride. 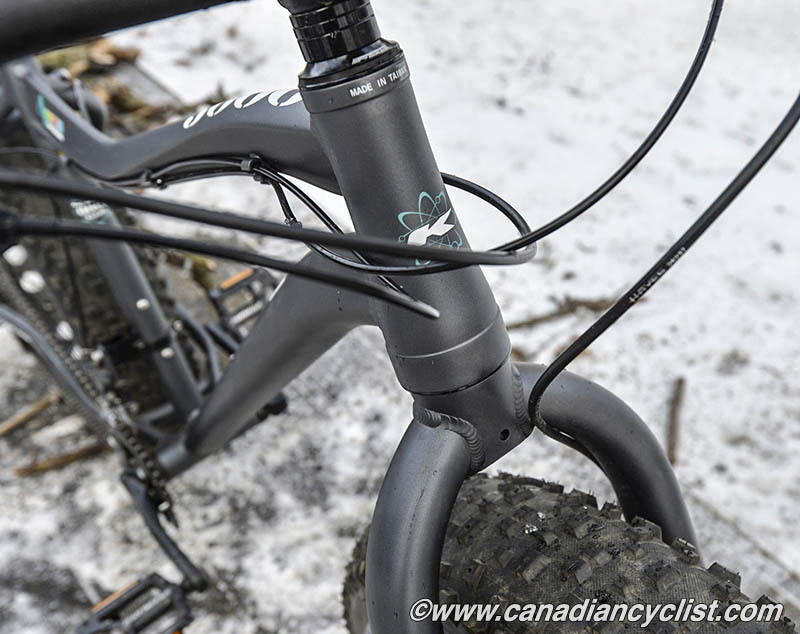 As with all fat bikes, ride characteristics are heavily influenced by tire pressure; meaning if you get it wrong any fat bike will not handle well. The extremely large tires of the 3000 makes it particularly strong in snow and sloppy mud conditions. Where even some other fat bikes might start to slip in the mud or bog down in wet, deep snow, the 3000 rolls right along. Even when we had a thaw-freeze period that turned the trails into a hard, rutted icy mess, the 3000 rolled through it. It climbs extremely well and descends competently. 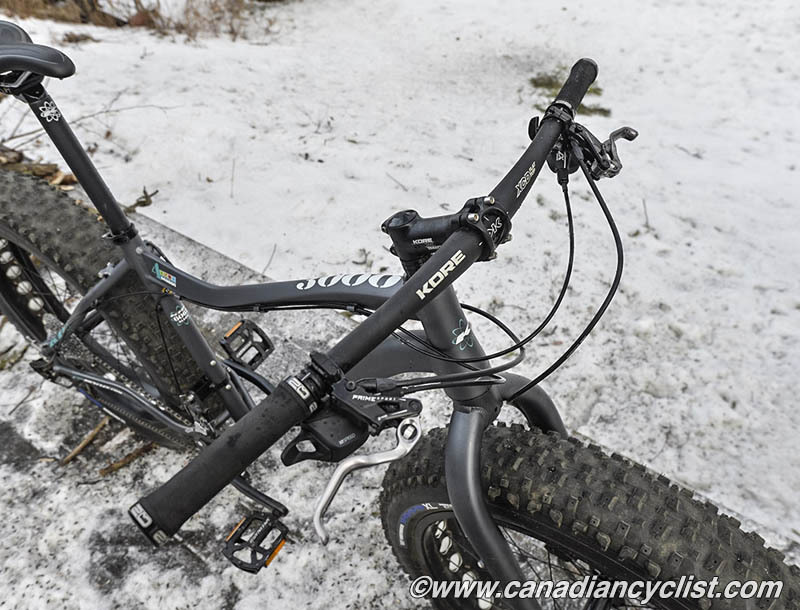 This is not a bike for high speed descending or fast riding on tight, technical trails - no fat bike is, really, but the 3000 is less-so than most. Bottom bracket clearance is excellent and it can roll over most obstacles. There seems to be a slight tendency to oversteer, but I think much of this can be chalked up to the wide stance of the handlebars (I would probably cut them down a bit, if it were my bike). The 3000 was one of the heavier bikes we tested, but that is, in large part, due to the larger than average wheels and tires. It is not a significant issue - no fat bike is really light - and the gearing means you can climb pretty much anything, but for some riders it will definitely be a negative. Move up to the carbon-framed 5000, and that issue will disappear completely. The KHS 4 Season 3000 is definitely a bike you can ride in all seasons, with its greatest strengths coming in adverse conditions.